Click here to watch Lupita paint! Lupita Cano is a self-taught abstract painter who loves to share her unique perspective of the world through her art. 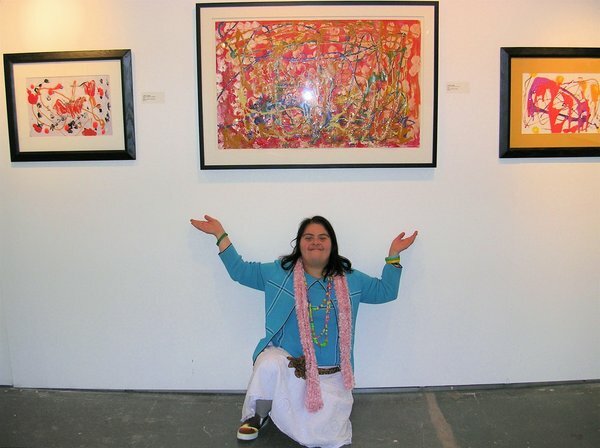 Lupita, who happens to have Down syndrome, was born and raised in Seattle as part of a close-knit Peruvian family that valued and encouraged creative expression. After graduating from high school she began to search for a job that would satisfy her bold personality and unfettered imagination. and her calling. With the support of her family, friends and her job coach, Lupita launched AE Designs by Lupita, selling note cards reproduced from her original paintings. regional and national disability conferences, fundraisers, through retail shops and online. Lupita also contributes to her community by donating her work to charitable causes. As a disciplined artist she has devoted countless hours over the past 20 years to developing her natural talents. Her preferred medium is acrylic paint, although she enjoys experimenting with various mediums and techniques. Her style could be described as exuberant, deep and layered. She is fearless in her use of color and does not subscribe to any rules or boundaries that would contain her artistic vision. 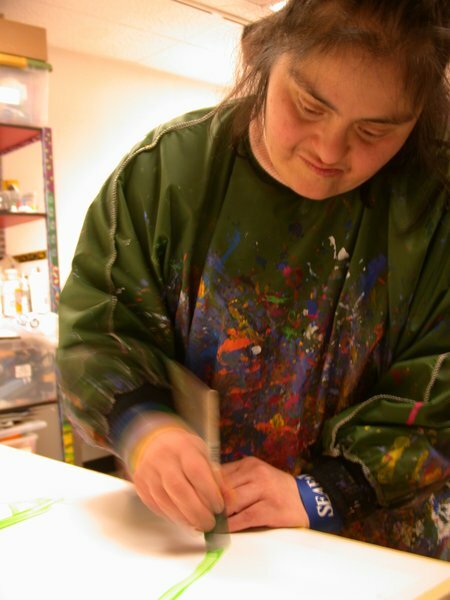 In February 2018 in Seattle, Lupita's artwork was featured in a musical titled "Imaginary Opus: A Sensory Experience in Two Acts". Projections of her paintings were utilized in the performance, while an art exhibition showcasing a retrospective of Lupita's work, "I Beg To Differ", was on display in the theater lobby. The musical was conceived and written by her sister, Rose Cano. Lupita paints at the Vibrant Palette Art Center in Seattle, the Museum of Special Art (MOSA) open studio, and at her home. She enjoys being a business owner, contributing member of her community, and an inspiration to others. Lupita encourages others to "listen to their hearts and take a chance". “When I paint, I let my mind do the talking for me. I let my hands do the talking for me. For example, I think about Dad, or what’s going on, and paint it. a happy day like Wednesday, or if it’s a blue, sad day like Monday. “I see blobs of paint, I see aqua, or red, moving through the air. within you, as if you were the paintbrush.